(BB) Looking back at NFPA 2018, the conference focused on life safety trends, such as providing guidance handling trending hazards such as energy storage, explosions and growing cannabis. While hazards evolve and the demand to protect the new hazards increases, it’s important to align and set industry best practices. I did get the opportunity to catch up with old friends within the Fire protection industry while walking around the expo and learned some had moved on to new positions while others are heading into retirement. I appreciate how the industry still feels small, while also recognizing how much ingenuity was on display in the expo hall. At the expo, the most innovation I saw was in the special hazards industry. Clean agent companies showcased lower noise dispersion nozzles in response to clean agent discharges involving spinning disks within the data center industry. The manufacture, Sevo, displayed their new system which keeps the halocarbon agent, Novec 1230, separate from the nitrogen until discharged. Other recognized trends with the clean agent system manufacturers include offering the systems with increased operating pressures, moving from 360 psi to 500 psi to allow for zoning. (CK) One trend that stood out to me at the NFPA C&E 2018 was the large presence of different technologies around traceability and monitoring of fire protection systems. It seems the industry will be moving toward smart or cloud base monitoring systems. In addition, there was a large presence of suppression systems as alternatives to standard sprinklers. I’m interested to see how the industry adopts these moving forward and what regulations will need to be adapted to continue innovating for life safety. (SS) NFPA C&E 2018 showcased a lot of product innovations from manufacturers but there is a clear trend focusing on capturing system information and data. Whether it was design software content that performs better with more built-in data, remote monitoring and collection of system data, or the integration of fire protection design software into traditional design software used in BIM, the organization and utilization of data to make processes automated and more efficient was very evident. Victaulic’s VDC (Virtual Design and Construction) is leading the way in design content and utilization of technology and data in the BIM process. (BB) As the technology manager for fire suppression, it’s always rewarding seeing the culmination of my team’s work being displayed at the expo and seeing customers’ reactions. When I have the opportunity to hear about how our newest solutions will impact life safety and the effect it had someone’s day to day life for the better, like saving the fitters from wear and tear on their body, it reminds me of the importance of the little things my team works on every day. I’m proud of the thoughtfulness my team incorporates into their work, and it’s nice to see it on display. 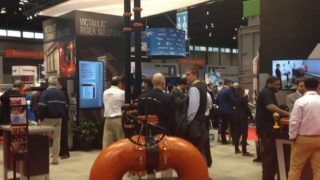 (CK) Every year at NFPA C&E, Victaulic has considerable foot traffic around the booth. I believe this highlights the innovation of Victaulic products, as well as the relationships Victaulic possesses throughout the industry. (SS) Since I first started at Victaulic, it has been clear the fire protection industry is a passionate group willing to adopt new technology if it provides the value they’re looking for. Working in product development it’s crucial to involve those who work with our products every day, both early and often. While attending the seminars and spending time at the Victaulic booth, I was proud to reconnect with many of the sprinkler contractors who have installed FireLock™ IGS™ products over the past year, the UA training team who shares the same passion for industry education, and the AHJ’s who I’ve met at previous CEU courses. It’s Victaulic ties to the industry that makes me proud to have the company name on my badge. (JC) One of the best aspects of being a representative for Victaulic at the conference was the way people reacted to your comments and questions during the educational seminars. Attending my first conference for Victaulic, I was able to experience the industry from a different perspective. As a former AHJ, I used to attend these conferences to learn from industry leaders. And now because Victaulic has such a pulse on the industry, I felt confident being viewed as an industry leader. The National Fire Protection Association’s (NFPA) mission is to help save lives and reduce loss with information, knowledge and passion through being the leading global advocate for eliminating death, injury, property and economic loss due to fire, electrical and related hazards. Victaulic is proud to share these same values, working together to keep the world both informed and safe. Victaulic, the world leader in pipe joining solutions, is excited to attend NFPA each year as the conference is an industry benchmark. This year, we created a best in class booth experience, featuring our newly launched Style V9 sprinkler coupling. Victaulic is pleased to attend the NFPA conference, where innovation and life safety are at the forefront of their mission.